At full band Renhornen counts 25 musicians on stage. 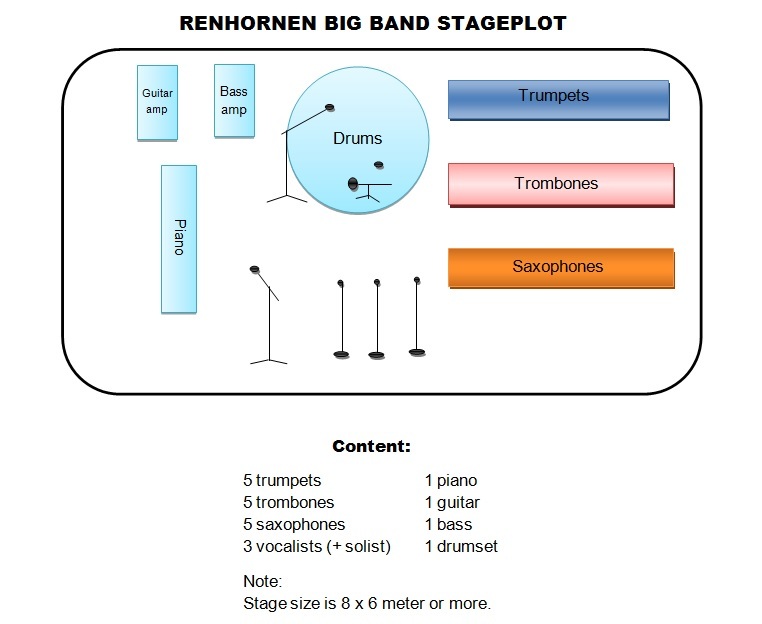 In order for us to make our best possible performance we would like to have our stage as shown by the stageplot image below. The stage is ideally 6 x 8 meters, but we are flexible and will adapt to the space at hand. We have managed to fit onto all kinds of stages during our more than 50 years in the business! Primarily, we will use our own audio system and sound engineer. The power supply will be adequate with 3 10A (ampere) outlets, although 16A 3 phase outlets are optimal. We bring our own power strips and power cables, but we may need extra extension cables if the nearest power point is more than 25 meters away. Normally we use the lighting at hand. On stage we will also need 9 chairs without armrests. If there are any uncertainties concerning our stage setup you may have more information at the time of your booking. Do not hesitate to ask if we can fit on your particular stage!